Watch as wildfire overruns packed California freeway, burns cars. 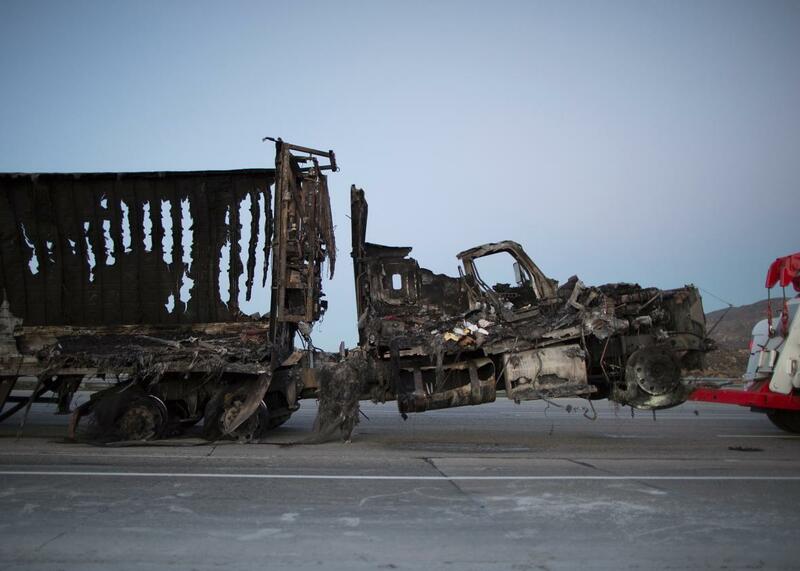 The scorched remains of a truck are towed at the north fire, which caused people to abandon their vehicles near Victorville, California. A fast-moving fire in Southern California overran a packed freeway on Friday, setting fire to 20 vehicles as panicked drivers scrambled for safety. As motorists looked on helplessly while their cars were engulfed by flames some 1,000 firefighters battled the North Fire with 22 fire engines, four water trucks, a bulldozer, seven airplanes, and three helicopters, reports CNN. “In a region where brush fires are a way of life, the scene on the main route to Las Vegas was surreal,” notes the Los Angeles Times. Around 60 to 70 cars were abandoned, which then made it more difficult for emergency responders to access the area. “I’ve never seen anything like this before,” California Highway Patrol Officer Steve Carapia said.